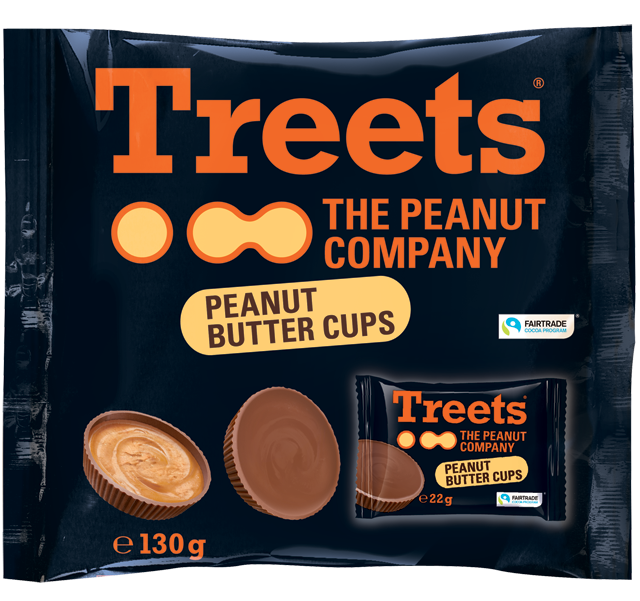 The Treets range covers everything what makes a peanut fan’s heart beat faster. 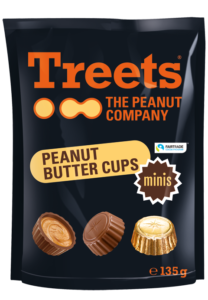 Peanut butter, in a crunchy milk chocolate as a big and mini cup, or for meantime snacking with Treets Buttons. 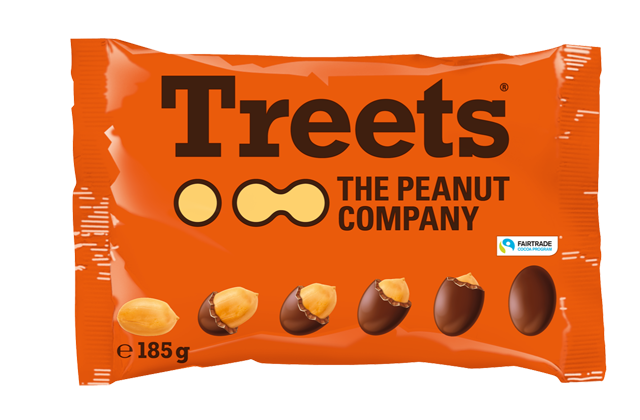 Whoever prefers whole peanuts will find his new favourites with milk chocolate finish in Treets Peanuts. And since we really live sustainability, we’re using 100 % fairtrade cocoa and resign artificial colouring. 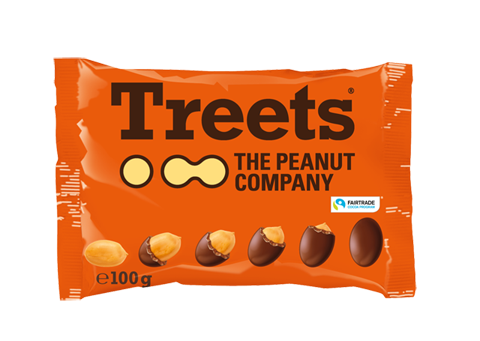 Peanut fans will find their new favourites covered in milk chocolate and tenderly sugar panned in Treets Peanuts. MILK CHOCOLATE (51 %) COVERED PEANUTS (25 %) IN A CRISP COLOURED SHELL. Ingredients: sugar, 25 % peanuts, cocoa butter, whole milk powder, milk sugar, cocoa mass, emulsifier: lecithins; glucose syrup, colours*, thickener: gum arabic; rice starch, glazing agent: carnauba wax, bees wax, white and yellow; table salt, maltodextrin, colouring foodstuff: beetroot juice concentrate. Milk chocolate: cocoa solids: 25 % min, milk solids: 14 % min. May contain traces of hazelnuts, almonds, soya and gluten. Small children can choke on nuts. The full peanut load - peanut butter in a crunchy chocolate cup. MILK CHOCOLATE WITH 50 % PEANUT FILLING. Ingredients: 28 % peanuts, sugar, palm fat, cocoa mass, cocoa butter, milk sugar, whole milk powder, dextrose, emulsifier: lecithins; table salt, flavouring. Milk chocolate: cocoa solids: 25 % min, milk solids: 14 % min. May contain traces of hazelnuts, almonds, soya and gluten. Keep cool and dry. 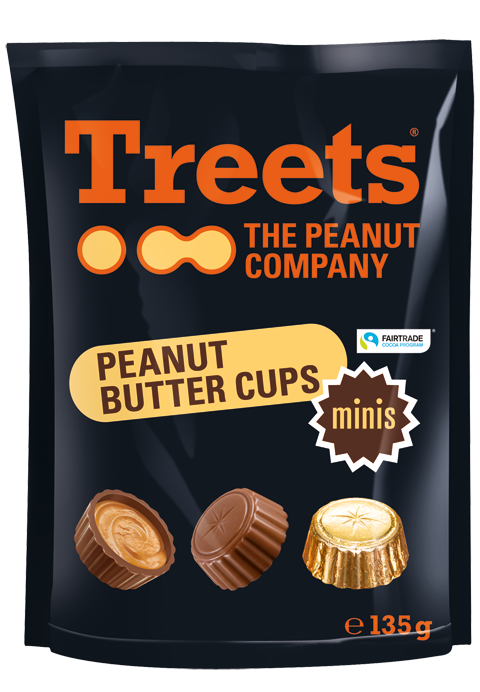 The full peanut load - peanut butter in a crunchy mini chocolate cup. A sinful core of peanut butter and milk chocolate, in a crispy sugar crust, as a meantime snack in Treets Buttons. 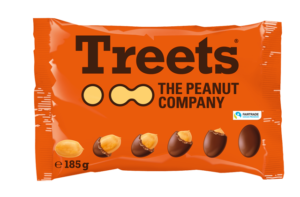 PEANUT-CONTAINING DRAGÉES WITH 30 % BROWN SUGAR COATING. Ingredients: sugar, 19 % peanuts, cocoa mass, cocoa butter, milk sugar, whole milk powder, table salt, rice starch, glucose syrup, emulsifier: lecithins; colours*, flavours, thickener: gum arabic; glazing agent: carnauba wax, bees wax, white and yellow; maltodextrin, colouring foodstuff: beetroot juice concentrate. May contain traces of hazelnuts, almonds, soya and gluten. Small children can choke on buttons. And since we really live sustainability, we’re using 100% fairtrade cocoa and resign artificial colouring. MILK CHOCOLATE (51 %) COVERED PEANUTS (25 %) IN A CRISP COLOURED SHELL. Ingredients: sugar, 25 % peanuts, cocoa butter, whole milk powder, milk sugar, cocoa mass, emulsifier: lecithins; glucose syrup, colours*, thickener: gum arabic; rice starch, glazing agent: carnauba wax, bees wax, white and yellow; table salt, maltodextrin, colouring foodstuff: beetroot juice concentrate. Milk chocolate: cocoa solids: 25 % min, milk solids: 14 % min. May contain traces of hazelnuts, almonds, soya and gluten. Small children can choke on nuts. MILK CHOCOLATE WITH 50 % PEANUT FILLING. Ingredients: 28 % peanuts, sugar, palm fat, cocoa mass, cocoa butter, milk sugar, whole milk powder, dextrose, emulsifier: lecithins; table salt, flavouring. Milk chocolate: cocoa solids: 25 % min, milk solids: 14 % min. May contain traces of hazelnuts, almonds, soya and gluten. 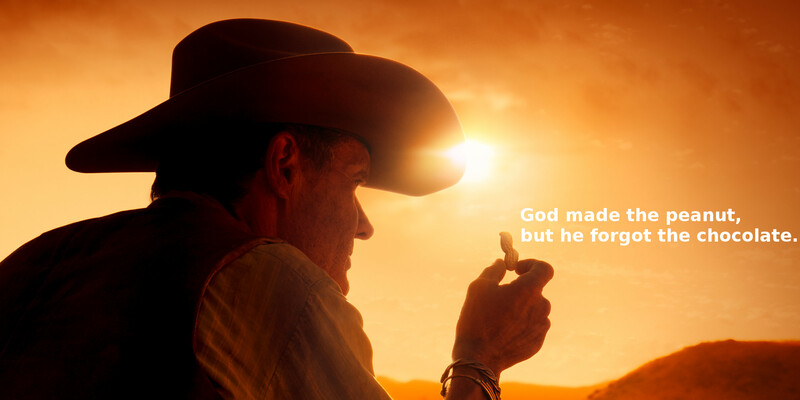 Keep cool and dry. 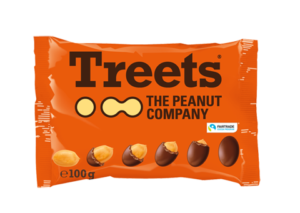 PEANUT-CONTAINING DRAGÉES WITH 30 % BROWN SUGAR COATING. Ingredients: sugar, 19 % peanuts, cocoa mass, cocoa butter, milk sugar, whole milk powder, table salt, rice starch, glucose syrup, emulsifier: lecithins; colours*, flavours, thickener: gum arabic; glazing agent: carnauba wax, bees wax, white and yellow; maltodextrin, colouring foodstuff: beetroot juice concentrate. May contain traces of hazelnuts, almonds, soya and gluten. Small children can choke on buttons.